« Should The Fort Hood Tragedy Be Reduced To Linkbait? We’re excited and proud to announce that Vidly is the first Twitter video service to support full 720p HD video. Traditionally, video on Twitter has been low quality UGC. We want to encourage sharing of high quality content to see Twitter become a real promotional channel for filmmakers, large or small. Twitter’s promotional potential is not fully realized, imagine movie trailers and music videos from original content creators. To celebrate the launch, in partnership with Pure Digital, we’re running a contest called “Flip Fridays” where we’re giving away Vidly branded Flip MinoHDs every Friday to get everyone in the HD spirit. Flip was kind enough to sponsor the contest to help promote HD on Twitter. Vidly lets you record and share videos using your computer or iPhone, and it also lets you upload existing videos to share. I’m skeptical about the value that Vidly offers. Sure – it lets you share HD videos via Twitter – but why not just put your video on YouTube or Vimeo, sites with built-in audiences, and then share it on Twitter? It’s not clear what problem sites like Vidly solve. 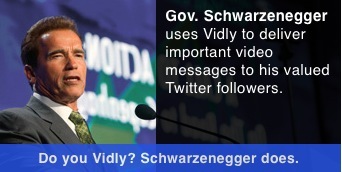 Governor Arnold Schwarzenegger is using Vidly, though. Is it because Vidly offers a unique solution – or because California’s too broke to host their own videos?